Using gnuplot to make simple line graphs. 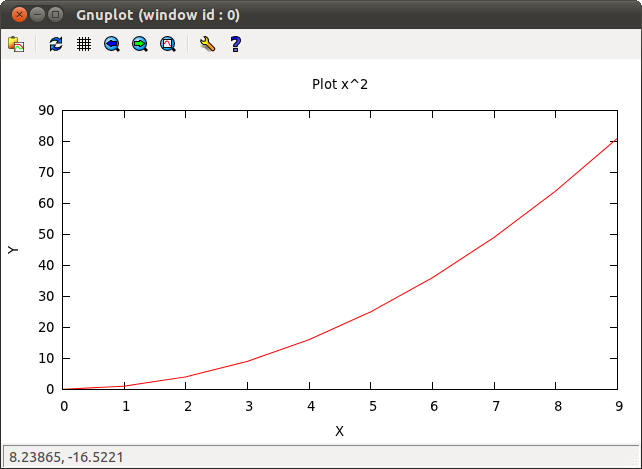 Gnu plot is an amazing tool. It's great for generating quick plots from bash. I've had my programs generate statistical data and then thrown it into gnuplot so I can better understand how my program is behaving. Unfortunately every time I use it I end up having to go back to the web to relearn the basic syntax of creating a line graph. I'm going to try and save myself some time by documenting the basic usage here. 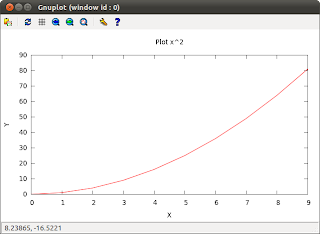 To draw a simple line graph first place the points to draw in a separate file in this case named "gnuplot.data"
Let me start off by stating that I'm a big fan of test-first development. I think that a (the?) major benefit of writing unit-tests is the fact that the first person to use a new API is the developer herself/himself. By first writing tests against the API before it has written you increase the likely hood of creating a unable, testable and bug free code. Test-first development is valuable even if you never ran any of the unit-tests that you wrote. The purpose of this post is not to extol the virtues of test-first development but to share a scenario where I feel it may be better to not write the unit-tests right away. Several weeks ago I started to work on a simple command line utility. Nothing fancy but just something to scratch an itch that I've had for a while. I had a vague idea of what I wanted it to do but hadn't quite worked out all of the details. Additionally I wasn't sure how the utility would involve. Finally I was writing the utility in Google Go, which I have done a bit of development but I certainly haven't played with it long enough to fully think in the language. In short I simply didn't know what I was doing and I knew it would be some time before I fully understood the problem I was trying to solve. I started to write the code and neglected to start by writing unit-tests. After some time of hacking on the utility I finally got to the point where I had a working prototype and I finally understood the problem. At that point I reviewed the code of my program and I realized that I had (not surprisingly) got the architecture of the program wrong. I figured out the right architecture of the program and started on the refactor. During the refactor the majority of the original code and internal API's was radically changed. If I had written any unit-tests they would have been discarded as the code and API's they would have tested simply did not exist in the refactored program. I could have preserved end-to-end tests but not any unit-tests. During the refactor I wrote unit-tests and I now have a program that has good unit-test coverage. I'll call this development process "Test Second Development". I'd like to propose the following criteria for when test-second development may be appropriate. You don't understand the program you are writing. You don't understand the language you are writing the program in. You will have the luxury of refactoring the program once you understand it, and before it "ships". You're disciplined enough to write unit-tests when you do your rewrite/refactor. In other words I think it may be OK to delay writing unit-test when you are writing a true *prototype. My thoughts on test-second development are still immature and evolving, but I thought I'd jot them down for future reference. In my case I don't think that I would have gained any benefit to using test-first development and I can definitely see how test-first development would have slowed down the discovery process. * If you are writing code for your job and anyone else will know about your project, then I really doubt you will ever write a prototype. As soon as someone sees or hears about your project they'll want to ship it. I once worked for a company that shipped a simple utility that I had written to aid in testing my code. I only found out that they had shipped it after my manager came and talked with me about the utility and told me that I needed to pretty up the GUI. When I told him that it was a testing utility and was never meant to be shipped he told me that since it was shipped we'd have to support it. I started prettying up the GUI and started on a new testing utility. The new testing utility had a big banner across the front stating that it was for internal testing only. I later learned that calling testing tools something like "The enema tester" was a good strategy for ensuring that internal testing tools never got shipped. This is more of a note to self, so I can look up this information in the future as needed. Google Go makes it really easy to cross-compile. Here is how you an compile your Go project for another architecture. The first step is to compile the cross compiling compilers (I can't believe I just typed that). So lets checkout the source code for the go compiler. If you want to create compilers for a different architecture you set the GOARCH environment variable and then run the make.bash script. The all.bash script compiles the compiler and runs the unit tests, the make.bash script just compiles the compilers. This will create separate compilers, linkers and assemblers for each of the three architectures. Because each compiler, linker and assembler have a different name you can have support all architectures simultaneously. Once you have the Go compilers compiled you can now compile your project for different architectures by creating a Go Makefile and setting the GOARCH environment variable before typing make. That's it! You can now cross compile your Go code. More information on the Go compilers, creating a Go Makefile and getting started with Go can be found here, here, and here respectively. Happy Hacking! Last year I decided that it was time to finish up my Masters degree. I recognized that in order to finish in a timely manner I would need to forgo all hobbies for a while and so this blog has been on hold. I'm now done, or at least I'm at the stage where I'm waiting for the final announcement that I'm done and so I'm now returning to normal life. After having dropped out more than a year ago I'm finding that it's taking some time to get adjusted to normal non-academic life. I'm also slowly starting to remember all the non-homework activities that I used to participate in. I wonder how long it will be before I become as busy as I was before.